In the first part of this milking series, we talked about the importance of being smart about the numbers you see from the robots. In part two of our series, we are going to focus on why keeping it simple means going back to basic cow comfort. Have you ever heard the old adage “At breakfast the chicken is involved, but the pig was committed”? The same principle can be applied to milk harvest. In the agricultural world, harvest is common, but the reuse of the plant or product is not. In the dairy world, however, harvest is done quite frequently and in the case of milking, 3 or more times per day is not uncommon. In dairy farming, the gentleness with which the harvest occurs is essential. It’s very rare to see the mechanical device that is performing the harvesting have so much contact with biological tissue other than in milking. As a result, there are very few places where the need for gentleness on the tissue has a higher impact than in the event of a liner interacting with a teat. When you consider that in the course of a 305-day lactation cycle, there can be upward of 60 hours of unit on time, gentle activity is paramount. So, why don’t we just copy what the calf does? While mechanical milk harvesting certainly could mimic what the calf does, the difference lies in the fact that the calf has all day to harvest the cow’s production. In the economic reality of dairy farming, there is a need for the harvesting machinery to be more productive than the output of just one cow. To that productivity need comes a balance where output and speed are necessary, but the need to be in-line with the cow to provide sufficient comfort is critical. If the milking event is not comfortable for the cow, long lasting damage can occur to the teat tissue, compromising the cow’s natural ability to defend itself from bacteria and disease. If pain is caused, the cow’s full participation in future milking events will be decreased and milking events will not be as productive. Gentleness is a primary need when designing equipment for milk harvest. Interestingly enough, one major cause of uncomfortable milking is milking a teat that lacks significant milk. When milk flow falls below a certain threshold (commonly accepted at about 2lbs per minute per cow), teat-end stress can occur. 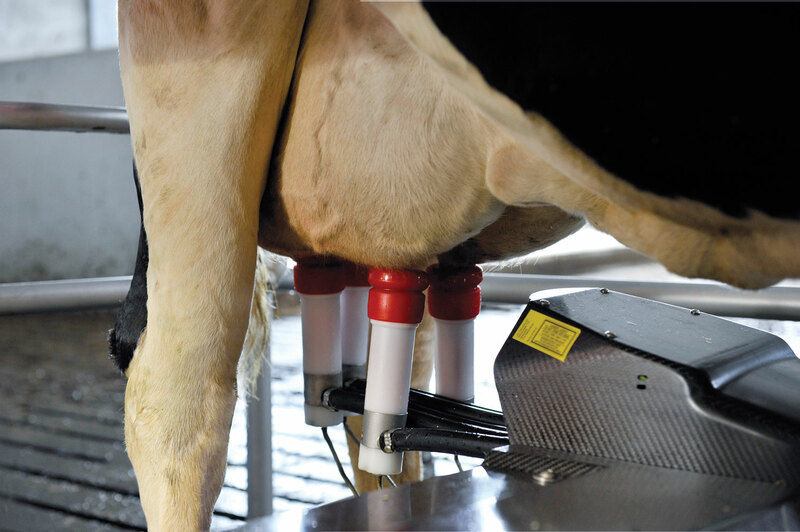 When you have quarter milk monitoring, like the monitoring presented in most robots, the individual needs of each quarter can be precisely addressed and that specific teat can have its teat cup removed as needed. This monitoring alone provides significant improvement to the comfort of the cow as she is being milked, encouraging her to continue full participation. To sum it all up; comfortable milking can be achieved and will benefit you and your cow. Providing proper stimulation and lag time to assure the full participation of the animal is essential. Additionally, you will need accurate detection of milk flow and proper programming of equipment that gently removes the teat cup after flow has decreased. Periodic evaluation to assure these events are consistently taking place will prove the cow agrees, comfort is one of the important characteristics in the milking procedure.